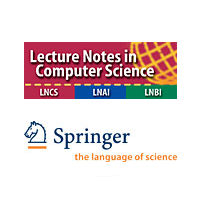 The conference proceedings will be published in the Springer-Verlag series "Lecture Notes in Artificial Intelligence" and we strongly recommend the use of the Springer LaTeX style. To ensure reasonable quality and consistency of preparation, it is important that authors adhere closely to the instructions. Any manuscript submitted in technically unsuitable form will be returned to the author for retyping. LaTeX2e stylefiles and MS Word template for multi-author books and proceedings can be downloaded from Springer http://www.springer.com/comp/lncs/authors.html. Initial submissions must be FULL papers (preferably 10 pages) and not merely abstracts. Initial submissions can be only a PDF file with full paper. Volume Editor(s): L. Rutkowski et al. It is sufficient if one author of each contribution signs the form on behalf of all the other authors. the copyright form should be submitted during the final submission as a separate zipped pdf file. the scanned completed and signed copyright form. By submitting the paper to the ICAISC conference the author(s) agree that they did not submit this paper to any other conference and one of them will attend the conference to present the paper. Please note that all papers will be assigned a paper number. You will receive this number after you have completed the paper submission process. Authors are then required to use the paper number assigned to them for all future correspondence regarding this paper. Please click here to proceed to the ICAISC 2018 Paper Submission System. If you already have an account from ICAISC2017, please use this login information or click "Remind password".